Easy 3D workflow diagramming software with rich 3D workflow examples. 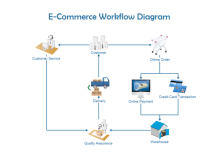 Download order workflow, e-commerce workflow and service Workflow diagram without paying a dime. 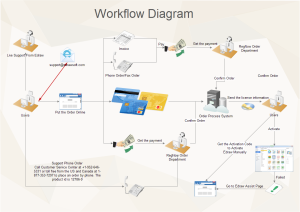 Workflow chart/diagram is a graphic representation of all the major steps of a process. Seeking a solution for maximizing the efficiencies throughout the workflow diagramming? How to make a workflow diagram? How indeed does one go about it, without seeing examples of Workflow? All of these problems can be solved fast with well-designed templates and examples. Edraw is a professional 3D workflow diagramming software with rich examples and libraries. It's easy to draw 3D workflow diagrams with the simple drag-and-drop functionality. 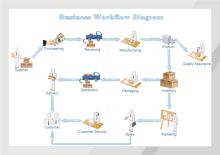 Use the well-formatted improved 3D work flow diagram templates created with smart 3-D Workflow shapes in Edraw to diagram information flows, work flows, business process automation, business process re-engineering, and accounting, management, and human resources tasks. You can also use shapes to document Six Sigma and ISO 9000 processes. 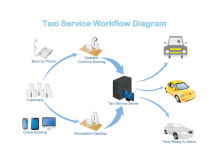 To save time and effort, try this template to show the workflow of taxi service, through which you can make impressive results. Every process is clearly visualized with 3D shapes. You can also use auto connection function to link shapes. Click the picture to view full size and download. An e-commerce workflow example is the perfect solution for those users who need to build a diagram in a rush but also require professional results. Click the left picture to enlarge and download. See more examples through this link. This example uses 3D shapes to visualize the 3D workflow clearly. Even the arrow connectors have connection points, two. Click the right thumbnail to enlarge and download. Make some modifications if necessary. Creating a workflow diagram in Edraw is fast and easy. It only takes a few minutes to choose a basic template, insert text and images, and add the finishing touches.